There was a time when the bright lights of huge coastal mega-cities like New York and Los Angeles attracted hordes of people seeking employment. However, today’s relocating employees are drawn to lower-cost markets – especially in the southeastern states. 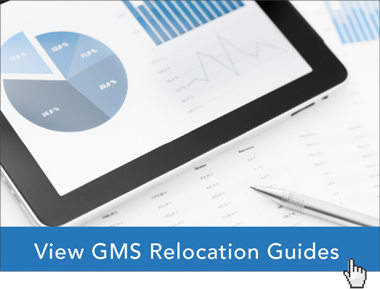 According to US News & World Report, the majority of 2016 relocations went to Florida, Texas, and North Carolina. Half of the top-ten list of Top US Cities from US News & World Report is comprised of cities from the “Sunshine State.” Not surprisingly, when comparing the cost of living in New York City to that of Ft. Myers, Florida, it is easy to see the savings that can be realized by both residents and businesses. Compared to Ft. Myers, New York City has consumer prices that are 40.75% higher, average rent that is 225.70% higher, and grocery prices that are 30.95% higher(1). The median home purchase price in New York City is $825,000 ($1,728,950 in Manhattan), while it is only $247,000 in Ft. Myers(2). Lastly, utility costs and transportation expenses in the Big Apple are 37% higher and 24% higher respectively than the costs in Ft. Myers(3). At Global Mobility Solutions (GMS), we see this trend in action. In 2016, roughly one third of all our relocations were to the Top US Cities in southeastern and southwestern states. If you are thinking about relocating to another city, request your complimentary city-to-city cost comparison. This free report will detail the cost of living expenses of any two cities of your choosing. Learn before you leap. Request your Complimentary City 2 City Comparison now!